Local Expertise, Free Coordination, and Best of All.....Happy Clients! Aloha! Interested in a Hawaiian Style wedding? Destination weddings our specialty. You've come to the right place. 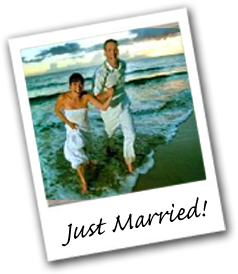 We've assembled a quality team of local professionals to help coordinate the hawaii wedding of your dreams. Just read what past clients have to say. We do weddings of all sizes and with FREE Wedding Coodination nobody beats our price! Complete Wedding Packages from $399! Whether you’re a first timer or looking to renew your vows, use Hawaiian Style Weddings’ best Wedding Coordinators to plan your special day. With packages that meet every budget you’ll have the perfect wedding of your dreams. LGBT Weddings too. We Did It Hawaiian Style! So Should You! "We can't put into words how beautiful and memorable our wedding day was and we have you to thank for coordinating everything.."
Read Additional Testimonials... Why Choose Hawaiian Style?